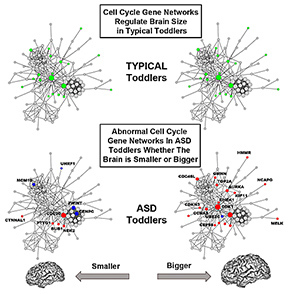 Gene function in cell cycle networks regulating brain size is normal in typical toddlers (green), while it is abnormal in ASD toddlers (blue, red) for both smaller and bigger brains. Bigger ASD brains are more severely affected than smaller brains. Many “high-confidence” ASD candidate genes are upstream and may control expression of other genes and networks with primary cell cycle functions. Courchesne said the findings raise the possibility that future research could test whether genomic biomarkers of cell cycle disruption could be an early sign of ASD risk or might be indicators of clinical progression, severity and outcome. Funding for this research came, in part, from the National Institutes of Health (grants P50-MH081755, R01-MH0800134, R01-MH036840, 1U54RR025205-0); the UC San Diego Clinical and Translational Research Institute (grants KL2TR00099 AND 1KL2TR001444) and the Novo Nordisk Foundation.